It’s National Philanthropy Day and kudos to all who give their time, talents and treasures to make our world a better place! I’m currently working on a fund appeal newsletter for my church. In the religious community we refer to philanthropy as stewardship, and our goal is to give just as God has given to us. We want to give out of love not only for everything he has created, but also out of love for God himself. Philanthropy, stewardship or just plain ol’ giving…whatever you want to call it, it’s a good thing to do. So thanks to all you movers and shakers, you who donate and you who care! With that in mind, I want to put out word to those needing help with their visual communications, whether it be design or copywriting. Each year Adunate does two pro-bono projects—one large and one small. If your organization needs creative assistance in 2014, click here for an application. And then, click here to guarantee your project’s success! 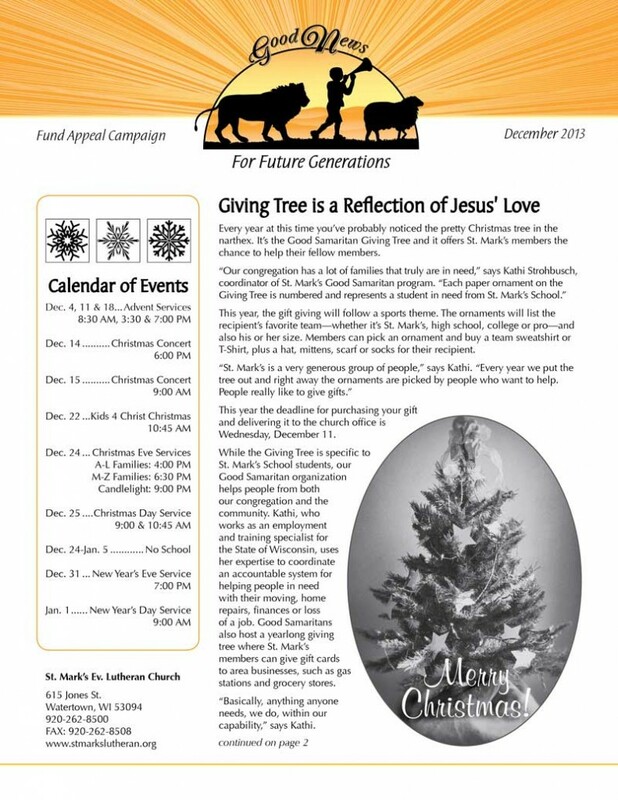 And while we’re talking giving, here’s the cover and inside page of my church’s newsletter. There will be more to follow, but take a look so far.